Terry Brooks, long-time author of the Shannara series, is venturing into the eBooks market with a new short story in the Shannara Universe exclusively for the Kindle. He will be releasing 3 total stories over the course of the year in partnership with Amazon to see how the new digital distribution opportunities empower authors to write and publish their content. The Shannara books are quick reads and demand little of the reader as the stories are straightforward hero-journeys that stay away from complex character relationships, political mechanizations or mysterious motivations/initiatives for the main characters; a trend which has become exceedingly popular over the past 15 years. They’re pure popcorn fantasy that feel like a nostalgic throwback to our youth (when many of us originally read these books). Many I know who once read these books have left the series behind in their youth – so this new short story will have less relevance for those who have spent little time lately with the series. Or it might serve as a quick reminder what fun the books are and pull them back in. Fingers crossed! The first of three short stories in this series is entitled “Paladins of Shannara”. It is a brief glimpse into the world of Shannara and is set shortly before the events of the original “Sword of Shannara” (published in 1977). The main character of the story is Allanon, the mysterious wizard-like Druid from the original trilogy, and a fan favorite of many. The story also serves as a bridge between “The First King of Shannara” (published in 1997, 20 years after the original book) and “The Sword of Shannara”. The story is quick, light, and relatively free of any deep character insights or major reveals that would normally appeal to fans. Based upon the description and the premise I had hoped for more and was somewhat disappointed. There was great potential for the story to show more than it did but in the end it felt too short and more of a light skimming into the world of Shannara. The story is for fans-only and would be of little use to persuade a non-fan to pick up the series. While the subject of the story would be irrelevant to a non-fan, the subject matter lacks depth and an intriguing hook. 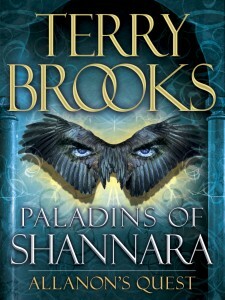 I would most likely use one of my favorite chapters from “The Druid of Shannara” to convert a non-fan than “Paladins”. In the end, the price tag and time investment is low and the story reminds us how far we have come as Shannara readers by bringing us back to the beginning of the whole series. The title “Paladins” seems to indicate that the other 2 stories might involve other characters (since the title is plural) or continue on with this same story arc. Either way, I’ll be fan-excited to read the other 2! I’m not sure how Terry Brooks can get much lighter. His Shannara series are all great if all you want to do is fight monsters. I am an avid sci-fantasy fan, but compared to other writers of the genre like Raymond Feist or Jennifer Fallon, he is very light on the personal relationships. His characters spend weeks or even months in each other’s company without realizing any connection but obligation, then at the very end a couple of them may get together. The next book in the series begins with the children or grandchildren of the previous book in the series. There is no family life or warmth except for the original friendships among the three or so who begin the trek to slay the monsters. Rarely are any emotions expressed except fear and sometimes anger, mostly at Allanon. I will continue to read until I finish all the Shannara series, but each one that I have previously read has left me feeling unsatisfied.